The Wisconsin State Patrol responded to 5,892 calls to assist motorists in February amid repeated winter storms and record-breaking snowfall across much of the state. Data provided to WPR show that of those calls for assistance, 1,648 were responding to cars sliding off of roads and 1,274 were responding to crashes. State Patrol Lieutenant Nathan Clarke said comparable data from 2018 were not immediately available but the month felt especially busy for responding officers. "February definitely hit us hard throughout the state of Wisconsin," said Clarke. "A lot of the weather impacts were definitely statewide and we certainly feel like we experienced a higher volume in the calls for service in February than other years." Clarke said the number off cars running off the road was higher than normal for winter months. "To have 1,600 approaching 1,700 runoffs that were not vehicle crashes but vehicles that had left the roadway was certainly a very high number," said Clarke. Two recent high-profile crashes in Wisconsin made national news in Februrary. On Feb. 10 more than 40 cars slammed into each other along Interstate-94 near Osseo. 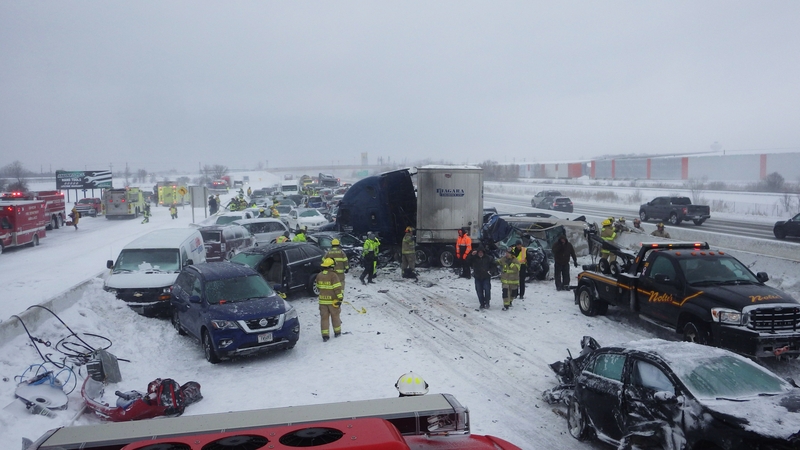 And on Feb. 24, 131 vehicles were involved in a crash along Interstate-41 near Neenah leaving one person dead and injuring 71 others. Despite those crashes, Clarke said fatalities on Wisconsin highways are actually lower this year than they were during the same time in 2018, possibly because conditions have forced drivers to slow down. In the city of Eau Claire crashes also spiked in February compared with prior years. There were 336 crashes reported last month, the highest number in the last five years. Eau Claire Police Department public information officer Bridget Coit said it’s been a busy winter for their officers. "I think with the unprecedented amount of snow that we’ve had this February we’re also seeing kind of an unprecedented amount of vehicle crashes," said Coit. In Eau Claire, like many other cities around the state, snowbanks have grown to six and seven feet high. Coit said that has caused it’s own set of problems. "Specifically in the last week or two the high snowbanks are really creating some visibility issues where people are pulling out into an intersection or pulling out from their driveway and just really not being able to see oncoming traffic," said Coit. But the conditions seem to have had a similar impact on the number of injuries resulting from crashes in Eau Claire. Coit said of the 336 crashes in February, only 10 involved injuries to drivers or passengers.